We are having a blistering heat wave here in Portland. It is an extremely unusual time for it. Of course we had a friend visiting for the worst of it so Portland kind of let me down in that respect. With good friends though none of that matters. The best day was the day we stayed in, so thank you, heat, for that. With this heat I had to be really diligent about watering things. And of course I was dumb and planted new things anyway. So far everything, new and old, seems to be holding up well. I have been eyeing my herbs though. I hate losing herbs simply because I got lazy about them, but truthfully everything else comes first. Today though, I thought about how much better my own herbs would be in the winter, not to mention the money I’d save, and I decided to get out there and clip some things. 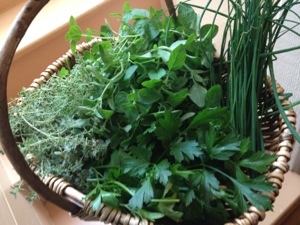 The parsley I prefer fresh so those will go in the fridge for using soon. The chives I might freeze in olive oil and then keep in the freezer. 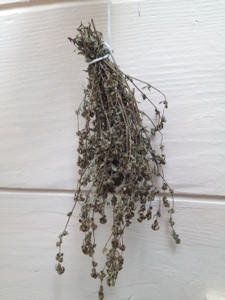 The thyme and oregano though I plan to hang dry. The key to drying herbs is, after washing them, make sure they are completely dry before hanging them in a well ventilated place. I tie them firmly to allow for shrinkage as they dry but I don’t tie them so tight that I pull moisture from them and mold builds up. You could take the time to clear the tying area of leaves but I’m lazy that seems wasteful. Then those bright happy bunches will look kind of sad when they finally dry. This entry was posted in Food, Opus, The Daily and tagged food, garden, gardening.